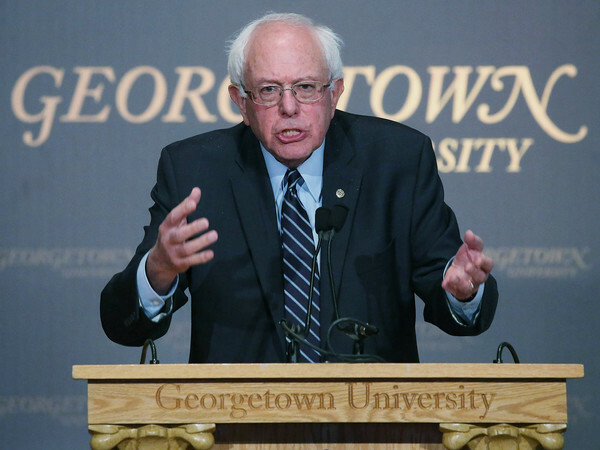 In a speech at Georgetown University, Bernie Sanders explained his economic views, showing that Democratic Socialism is not a form of socialism which opposes free enterprise, and that he is definitely not a Communist as Donald Trump claimed. Full transcript here. Sanders continued to provide considerable detail as to the economic problems we face. For the sake of brevity, and as these are arguments he has repeated multiple times, I advise reading the full speech but will not quote more on this portion of the speech here. So let me define for you, simply and straightforwardly, what democratic socialism means to me. It builds on what Franklin Delano Roosevelt said when he fought for guaranteed economic rights for all Americans. And it builds on what Martin Luther King, Jr. said in 1968 when he stated that; “This country has socialism for the rich, and rugged individualism for the poor.” It builds on the success of many other countries around the world that have done a far better job than we have in protecting the needs of their working families, the elderly, the children, the sick and the poor. I don’t believe government should own the means of production, but I do believe that the middle class and the working families who produce the wealth of America deserve a fair deal. I don’t believe in some foreign “ism”, but I believe deeply in American idealism. I’m not running to pursue reckless adventures abroad, but to rebuild America’s strength at home. I will never hesitate to defend this nation, but I will never send our sons and daughters to war under false pretense or pretenses or into dubious battles with no end in sight. In other words, despite the scare tactics employed by his opponents, including Clinton surrogates and some supporters, we are no more in danger of a Red Dawn in America than in Vermont when he was a mayor who was friendly to small business development. Sanders seeks to reform capitalism, not to replace it with true socialism. Our response must begin with an understanding of past mistakes and missteps in our previous approaches to foreign policy. It begins with the acknowledgment that unilateral military action should be a last resort, not a first resort, and that ill-conceived military decisions, such as the invasion of Iraq, can wreak far-reaching devastation and destabilize entire regions for decades. It begins with the reflection that the failed policy decisions of the past – rushing to war, regime change in Iraq, or toppling Mossadegh in Iran in 1953, or Guatemalan President Árbenz in 1954, Brazilian President Goulart in 1964, Chilean President Allende in 1973. These are the sorts of policies do not work, do not make us safer, and must not be repeated. The bottom line is that ISIS must be destroyed, but it cannot be defeated by the United States alone. A new and effective coalition must be formed with the Muslim nations leading the effort on the ground, while the United States and other major forces provide the support they need. Often the right looks ridiculous by raising the specter of Communism in response to programs from the left, such as with labeling the Affordable Care Act a government takeover of health care despite being based upon expanding private insurance coverage. I would think that more intelligent conservatives would avoid this line of argument. But what happens when it is the right argument and conservatives can’t legitimately make it without looking like the boy who cried wolf one too many times?After reading this absurd article by Fred Jerome at Salon, I’ll lend them a hand, and perhaps provide them with some cover. On this topic, sensible liberals and the right wing should be aligned in opposing this idea. Outcomes such a what occurred in the Soviet Union or Communist China are exactly what we should fear by this insane proposal to nationalize the news media. Imagine a world without the New York Times, Fox News, CNN, the Wall Street Journal, and countless other tools used by the 1 percent to rule and fool. In a socialist society run by and for the working people it represents, the mega-monopolies like Walmart, Halliburton, Exxon-Mobil, and the corporations that run the tightly controlled “mainstream media” will be a thing of the past. In a socialist society a portion of the media would be reserved for news disseminated by the democratically elected governing bodies, that is, working people elected by and for working people. But state ownership is not the only way media can represent the interests of working people, to speak with or through their voices. In most cases, the media would be owned and operated by working-class organizations—labor unions, neighborhood associations, and cultural centers. So news (and views) in a socialist society will be brought to you by a plethora of noncommercial sponsors. The government media will report on and discuss, for example, the major government plans for production, how to improve education, and more. But other media—newspapers, TV and radio stations, and Web sites sponsored by workers’ organizations, cultural organizations, youth groups, sports teams, and neighborhood groups will report on issues specific to their interests. The media has many faults, but shutting it down by nationalization could only lead to tyranny. The standard corporate-run media has its faults, and of course there is Fox. Attempting to shut down and nationalize any of them, even Fox, would be a tremendous blow against liberty. With all their faults, The New York Times, McClatchy, PBS, and other parts of the news media still provide a valuable source of information. Fox might be primarily propaganda, but defending freedom of speech includes those we disagree with (while we take every opportunity to also expose them). It is a shame that some conservative bloggers have given into the temptation to claim that this lunacy represents liberal beliefs, when this is the opposite of liberalism. While Obama’s poll numbers remain down from last year, there has been good news this week. Following a poor roll out, the number of people obtaining health insurance coverage under the Affordable Care Act has jumped significantly, and the number should grow as two deadlines for January coverage and for avoiding penalties approach. Another major success of the Obama administration was seen this week without very much attention. The government sold its last shares in General Motors. Beyond the obvious benefits to General Motors and the Michigan economy, this was a financial success for the government when tax revenue and money saved on unemployment claims is taken into consideration. This is also a philosophical victory. Despite record corporate profits and stock market gains under Obama, many on the right wing persist in calling him a socialist. The government investment in General Motors, called by conservatives Government Motors, was a major part of this argument. I recall many conspiracy theories on conservative blogs which predicted that by now the government would have completely nationalized General Motors and moved on to other companies. Of course to those in touch with reality, it was clear that the Obama administration saw involvement in General Motors as a desperation measure, and not something they desired to do. Conservatives have been claiming that Barack Obama is a socialist despite his centrist, pro-business economic policies. I’ve often wondered how they would react to actual socialists. Of course they would have a hard time finding many actual socialists any more among those with any degree of influence in the United States government. Robert Reich is pretty far left by American standards but even he argues that The Answer Isn’t Socialism; It’s Capitalism That Better Spreads the Benefits of the Productivity Revolution. Francois Hollande’s victory doesn’t and shouldn’t mean a movement toward socialism in Europe or elsewhere. Socialism isn’t the answer to the basic problem haunting all rich nations. The answer is to reform capitalism. The world’s productivity revolution is outpacing the political will of rich societies to fairly distribute its benefits. The result is widening inequality coupled with slow growth and stubbornly high unemployment…. Those on the right who see no role for government in the economy would find much to object to in Reich’s views, and perhaps, if they are honest, would see the difference between his views and Obama’s more moderate economic views. This would provide a framework for a far more meaningful debate than the current right wing arguments that Obama is a socialist. Of course, as the Republicans have no rational arguments to make regarding the economy, other Republicans including Mitt Romney are running with this false claim and we will probably continue to hear it. Taking comments out of context, or outright lying about the beliefs of their opponents, is one of the most common tactics used by the right wing. They know that the best chance to keep people from voting Democratic is to provide a false view as to what Democrats believe, considering that numerous polls have shown that most Americans support Democratic policies even if they do not realize that the policies are those promoted by Democrats. Is Barack Obama A Centrist? On line polls have minimal meaning but I found this one at The Economist interesting. If an American conservative magazine were to have a poll as to Barack Obama’s ideology, a majority of their readership would be deluded enough to claim he is a socialist. Of course to uninformed conservatives, socialism means a slight increase in the marginal tax rate on millionaires as opposed to its actual meaning of public ownership of the means of production. 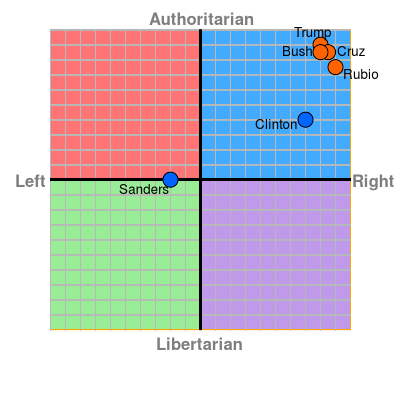 Of course a centrist remains far more liberal than today’s ultra-right wing Republican Party so I don’t want to hear any of the Bush2 nonsense which comes from some on the far left. Old definition: Socialism is public ownership of the means of production. New definition in teabagger-inspired America: Socialism is a few percentage point increase in the marginal tax rate on multimillionaires.